As a former Fugees vocalist found to her cost this week, only death and taxes are inevitable. Nobody’s told Wigan this, though. Roberto Martinez’s men have been cheating fate for years. Three seasons running the master escapologists have smiled gaily into the jaws of the Championship. Three times they lived to fight another day. Is this the year that Wigan, like the miseducated Lauryn Hill, finally pay the piper? A place in the relegation party remains up for grabs. Three is the tragic number. One more team will join the (not so) super-hoops of QPR and Reading in the Championship. One more set of fans must brew the coffee extra-strong and brace themselves for 9 long months watching Manish Bhasin’s witching hour of Football League highlights. Newcastle. It beggars belief that we are even discussing Newcastle. Despite the mid-season loss of Demba Ba to Chelsea, Newcastle still have some of the most talented players in the Premiership. How the hell are they down there? Alan Pardew won’t be the first person to win Manager of the Year one season and be relegated the next (George Burley saw to that when his Ipswich team were found floating face down in the water in 2002), but it’s a rather ignominious list to join. Surely a team that boasts the class of Hatem Ben Arfa, Fabricio Collocini, Yohann Cabaye and Papisse Cisse has enough to survive. By contrast, Aston Villa and their tedious brand of football have been bothering and boring me in equal measure for years. While most seasons I would be baying for their execution with all the fervour of a Daily Mail reader, I just can’t summon the anger this year. Playing a team of sub-23 year olds has too much derring-do about it to wish them any ill-will. Paul Lambert, himself a babe in arms in coaching terms, has also shown enough in his nascent managerial career to promise more. It would be good to see his penniless Midlands project continue in the top-flight. Heavy-spending Martin O’Neill has recently been at the helm of both Villa and fellow strugglers Sunderland. Relegation for either won’t do his legacy a great deal of good. The Black Cats play a not-yet-out-of-the woods Southampton at the weekend. Then it’s on to White Hart Lane, against a Spurs side gunning for the Champions League. Goal difference is Sunderland’s friend, though. If Wigan pull off a fourth Houdini act, this buffer should still be enough for the Wearsiders to avoid playing games on a Friday night next year. Which leaves us with Norwich. Norwich weren’t meant to play a part in this sorry tale. But ever since Christmas, Delia’s lot have looked like they, too, have been at the sherry, dropping from 7th to 16th. Failure to pick up points against West Brom puts the boozy pan-wielder’s boys in critical danger. They play Manchester City on the final day, a team who have averaged 5 goals a game against the green and golds since their return to the Premiership. I expect Wigan to get a result against Villa in Game 38 (who, by then, should be safe). The Toon must also, surely, somehow beat a path to safety. So when the bookmaker comes a-knocking, Too Good’s hard-earned/ill-gotten is going on the Canaries to fall down the mine-shaft. 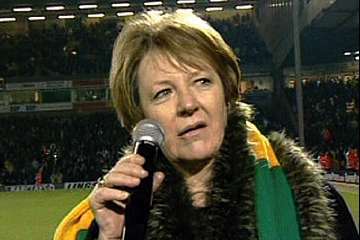 Norwich could do with a 12th man round about now.